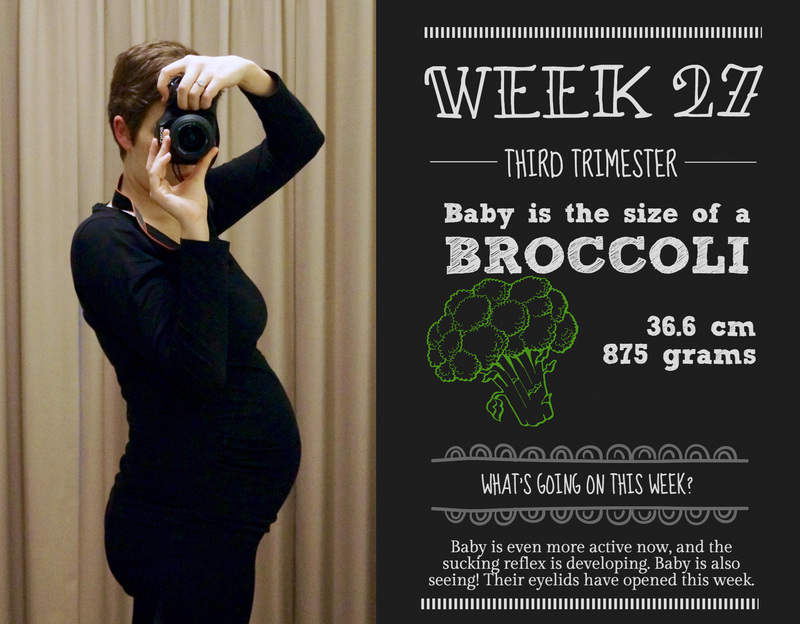 Baby: Broccoli (a broccoli? A head of broccoli? What’s the singular term?) – including all the leafy bits, I presume. I’ve been craving a bit of broccoli lately, watch out baby! What I’m cooking: A very wriggly baby! She’s starting a more active phase this week, so my belly dancing skills should improve immensely, without any effort on my part. She’s also opening her eyes this week! Very exciting, as externally this is one of the last areas needing development. Main symptom: Still the ribs. Ohhhh the ribs! I realised this week that the reason for the pain is that my uterus is right on my ribs at the moment, no wonder they’re sore! I’m hoping in the next couple of weeks I grow out, instead of up, which might provide some relief. What’s on this week: More yoga, more work, more online shopping! Getting to the stage now where time is starting to dwindle a little, so I’ve been going a little mad trying to get ready. Fun mad, but still mad. Firstly, can I say “holy bump, Batman!”? I can’t believe the difference in the size of my stomach from last week to this week! The third trimester certainly likes to make itself known! I’ve also gone from not really noticing the pregnancy too much (apart from some licking), to slowing down to a slug’s pace and groaning every time I have to move. Chairs have become my new best friends – I nearly clap with delight now when I get the chance to sit. The fatigue has made an unwelcome return as well, and combining that with my preggo brain has meant I’m basically a walking zombie. Drool and all. My work ethic is, shall we say, not spectacular at the moment, and just getting through the days is my current aim. What a high achiever! I was back at yoga again this week, which was again fantastic. I really can’t recommend it enough, even if it’s just for an hour of peacefulness each week. I come away from each session feeling limber, less achy, and reinvigorated. Granted, it only lasts until I wake up the next morning, but it’s nice all the same. I’ve also booked Mr Nester and I in for the hospital antenatal classes, starting in a few weeks. They cover the basics of how the hospital operates, what your pain management options are, and a few targeted classes on breastfeeding, coming home, and general newborn care. As formulaic as they may be, I’m looking forward to having that information so I can prepare myself for what to expect when we do eventually head into hospital. In other news, my cravings have made a bit of a recurrence in the last couple of weeks – ice cream is a mandatory addition to my evenings at the moment, and fresh, zesty fruit or drinks are really floating my boat. I’m currently daydreaming about Solo right this second. Funnily enough, though I feel like I’m eating for Australia at the moment, my weight gain has slowed quite a bit. There was a stage a month or so ago where I was gaining nearly a kilo a week (about 2lbs), but now I’ve slowed to around 0.3kg. Not particularly complaining as at least it’s not going to my arse, but I’d like to see it rise at least a little each week, so I know Grub is still growing nicely. Otherwise, I’m definitely feeling more pregnant this week, although still not enough for people on the train to notice and give me a seat. I’m a little concerned that my current levels of fatigue and achiness are only going to get worse as I get bigger…not quite sure how I’m going to be able to push through that to still get to work every day. Thankfully I have two weeks off coming up soon, so I’m very much hoping that reinvigorates me for the final stretch! Finally ,the third trimester. Congrats!! I was curious about the twins born at 25 weeks (u have mentioned in your previous blog). Are they doing well?